This badge was issued to OLUKAYODE DANIEL on 19 Jul 2016. The badge earner has a proven expertise to use a Big Data platform and data governance concepts to efficiently store and manage extremely large amounts of data, using IBM BigInsights. The badge earner has demonstrated advanced proficiency on topics such as Hadoop, Map Reduce, HBase, Big SQL, and BigSheets, in order to capture, store, and analyze structured and unstructured data. 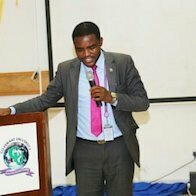 Must be a faculty member of a Higher Education Institution which has or is implementing the IBM Skills Academy Program. Completion of Module I - Data Management Overview: Covering Date overview, Industry Applications, Case Studies; Understanding Big Data. Completion of Module II - Big Data Foundations: Covering Hadoop Architecture and Administration; Big Data Platform and data governance. Completion of Module III - Big Data Developer: Covering Big Data Architecture; Storing and processing data with Hadoop; Creating data using HDFS and GPFS; Data distribution and storage with MapReduce; Hadroop Query Language (Pig, Hive, Jaql); Distributed storage system with Hbase and NoSQL; Queries using BigSQL; BigSheets analytics tools; Analyze structured and unstructured data with text analytics; Application Development Lifecycle. 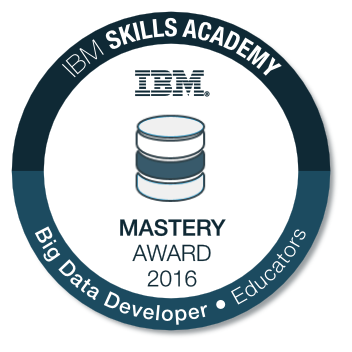 Passing the IBM Proctored Exam for "IBM Big Data Developer 2016".